If you’re updating your kitchen, bathroom, outdoor living space, or font foyer, you may need to determine the amount of tile you need to purchase for your project. Whether you’re installing the tile yourself, or you simply need to get a good estimate on what you expect to spend, you can easily determine how many tiles you will need to purchase. It’s helpful to tile installers if you can give them an estimated amount of tile up front. This helps them estimate the cost of installing the tile for you, as well as gives them a basis for helping you price the type of tile you want to use. 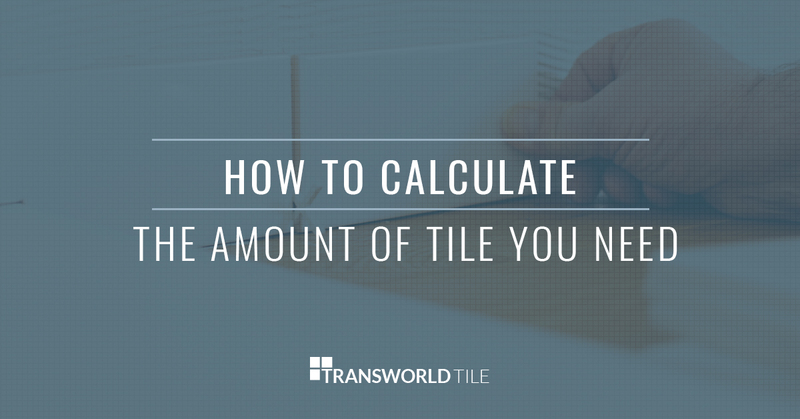 In this article, Transworld Tile is going to share with you a simple way to estimate how much tile you actually need for your project. Calculating the amount of tile you need for your project is determined by the square footage of the space. You’ll need some paper, a pencil (with an eraser), measuring tape, and a calculator (if you don’t want to do long-hand math). First measure one wall for total length from one end of the room to the other end. Then, measure the adjacent wall from one end of the room to the other end. This will give you two different measurements. Most of the time, these measurements are different, but if you have a perfect square for a room, the measurements may be the same. Now that you’ve measured the two walls, it’s time to do some math. Multiply the two numbers and record the total. For example, you may have a room that’s 25 feet by 10 feet. You would multiply these two numbers and record the total: 25 x 10 = 250. Now you have the square footage of the room. In this example, the square footage is 250 square feet. Typically, tile comes in a box, and you have to buy the entire box. This means that you will need to determine how many boxes you will need to fit your square footage needs. First, determine the square footage of tile in the box. Then, divide your total room square footage by the square footage of the tile in the box. For example, you have 250 square feet of floor to fill. The tile that you’ve chosen comes in 10 square feet per box: 250/10 = 25. In this example, you will need a minimum of 25 boxes of tile. At the end of your math, for this example, you will want to purchase 28 boxes of tile. The extra 3 boxes make up a little over 10 percent extra so that if mistakes during installation are made, you have extra. Step #5. Will Your Tile Be Discontinued? A great reason to add a box or two extra to your order is in the event that the tile you choose gets discontinued. If you cannot get your type of tile anymore in the event of damage, you’re out of luck. It’s best to be safe than purchase an entirely new floor because one piece of tile gets damaged. Whether you want to shop online or visit our showroom, we are here to help you find the best tile for your project. If you bring in the estimated square footage of your space, we can help you find the best deal on tile. Give us a call or stop by today!